Here are a couple of photos of some scarves I’ve been working on. The black and white one is almost done-it needs some fringe. I made it using Icelandic Jewels yarn from Hobby Lobby. If you haven’t seen it before It’s a really soft yarn with flecs of color woven in that really don’t affect the main yarn colors, just adds a little pizazz. If you look closely you might see them in this picture. The great thing is that it normally sells for over 5.00 a ball and Hobby Lobby periodically has it on sale for .99. Needless to say I’ve accumulated quite a bit, buying 5-10 balls whenever its on sale, and different colors. I know I have enough to make a few afghans and lots more scarves. 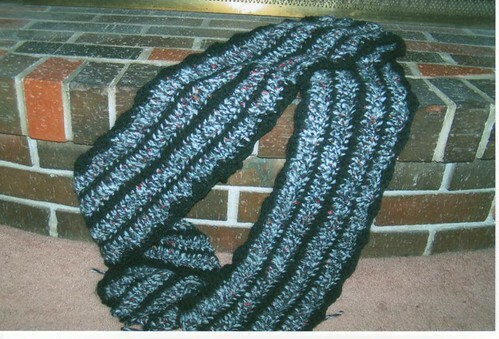 This scarf took 1 1/2 balls each of black and white. I did make it pretty long wanting it to be a nice warm wrap around scarf. 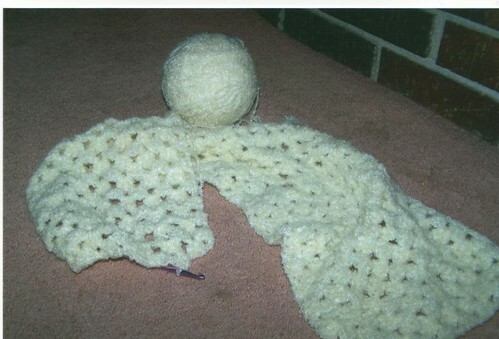 It’s done in triple and some double crochet going the length of the scarf. I found some patterns at christinascrochethaven.com. She’s another one of those great people posting free patterns for us to use. I had made a couple of scarves last year from her patterns exactly, learning something new and then was able to improvise, mainly using more triple crochets and a bigger hook making it go faster. The other is just worked in shells of double crochets out of a fine boucle yarn. I’ll probably make a couple more and then donate them all to my quilt guild for our Christmas party/ auction. Last year the two I made went for 18.00 and 20.00 which I thought was pretty good. We had such a variety of items-quilted, knitted ,crocheted, hand crafts, baked goods canned items-and when it was all done we had made about 1400. for our treasury. Not too bad for a afternoon of fun. I love both, but I really like the black and white one, it looks really cushy and soft!